Sponsorship levels range from $500 and up and provide a wide range of benefits specific to the various events. Custom opportunities available- contact Craig Culver at: culvertraining@gmail.com to begin discussions. Prominent corporate logo placement on team training and racing gear (Culvertraining© swim caps, cycling kits, triathlon suits, and polo shirts); Team meet and greet cocktail party; Special event appearances with Racing Team members; Prominent donor listing on Culvertraining© website; Business/Corporation logo link on website; Logo featured on all print/advertising material; Four team polo shirts. 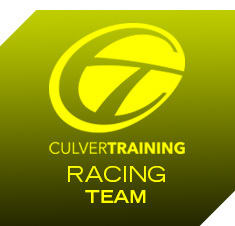 One year of FREE Culvertraining© custom training and Racing Team Member. Custom opportunities available- contact Craig Culver at: culvertraining@gmail.com to begin discussions. Prominent corporate logo placement on team training and racing gear (Culvertraining© swim caps, cycling kits, triathlon suits, and polo shirts); Team meet and greet cocktail party; Prominent donor listing on culvertraining© website; Business/Corporation logo link on website; Logo featured on all print/advertising material; Four team polo shirts. One year of FREE Culvertraining© custom training and Racing Team Member. Corporate logo placement on team training and racing gear (Culvertraining© cycling kits, triathlon suits, and polo shirts); Team meet and greet cocktail party; Prominent donor listing on Culvertraining© website; Business/Corporation logo link on website; Logo featured on all print/advertising material; Two team polo shirts. Corporate logo placement on team training and racing gear (Culvertraining© cycling kits and triathlon suits); Team meet and greet cocktail party; Donor listing on Culvertraining© website; Business/Corporation logo link on website; Logo featured on all print/advertising material. Corporate logo placement on team training and racing gear (Culvertraining© cycling kits and triathlon suits); Team meet and greet cocktail party; Donor listing on Culvertraining© website; Business/Corporation logo link on website. All levels include guest appearance(s) at agreed upon location. Endorsement of sponsor product and other mutually agreed upon arrangements.